John Galaty was awarded his MA and Ph.D in Anthropology from the University of Chicago in 1977, and since then he has taught in the Department of Anthropology at McGill University. He has served as Secretary in the IUAES Commission on Nomadic Peoples, on the Editorial Board of the journal, Nomadic Peoples, and as President of the Canadian Association of African Studies. Within McGill, he has served as Associate Dean of Graduate Studies and Research, Associate Dean in the Faculty of Arts, Interim Dean of Arts, Chair of Anthropology, President of the McGill Association of University Teachers and Director of the Centre for Society, Technology and Development. He has pursued research on pastoralists of Eastern Africa with support from the SSHRC, IDRC, FQRSC and NSF, and currently is co-director of the partnership project on 'The Institutional Canopy of Conservation' focused on community conservation in Kenya and Tanzania. The theory that land holding is inexorably evolving from common to private or state tenure is challenged by facts on the ground that this paper will examine. ‘Tenure’ is interpreted both in terms of formal law and informal practices. While the association between privatization and land fragmentation is clear, property theory has influenced privatization so the process cannot be used to validate the evolutionary model of transitions from open access to common property to private property. Although in many settings common and state property has given way to privatization, in other cases private or state property has reverted to common holdings. A dynamic tenure model would demonstrate the conditions under which tenure transitions occur between common, private and state property, as the balance between transaction and exclusion costs shifts, or when the boundaries of tenure forms weaken to allow open access to occur. Examining three scenes of tenure transitions involving Kenyan pastoralists (Laikipia County, the Rift Valley, Narok County and Kajiado County), this paper examines cases in which transaction and exclusion dynamics – which are metaphors for the institutional effects of social and territorial relations- lead to changing land-use practices and tenure transitions. In semi-arid pastoral regions, we find more fluid systems of tenure than the inexorable spread of privatization through formalized land rights and increasing land fragmentation would have suggested should occur in the 21st century. Without rain, no land is private. The theory that land holding is inexorably evolving from common to private or state tenure is challenged by facts on the ground that this paper will examine. Pastoralism involves mobile grazing of domestic animals. Given the large scale of land use practical for linking sporadic rainfall and grazing with human and livestock populations, pastoral territoriality joins wider communities to land in multiple dynamic and flexible ways (Galaty 2013a). This sort of linkage between pastoral groups and territories represent cases of “common property” in Ostrom’s (1990) sense of lands managed by defined collectivities, not Hardin’s (1968) “pastures open to all”. But in the pastoral context, group lands are often held through forcible assertion of rights that are variously recognized and challenged by neighbouring groups (McCabe 2004). Historically, during the 20th century, formalization of tenure has been imposed on many rangeland regions in two distinct modalities: through the legal assertion of state sovereignty in some countries (Sudan, Ethiopia, Tanzania), and through the imposition of private-holdings in others (Kenya, Botswana) (Mwangi 2007; Lesorogol 2008). It is thus reasonable to hold that Africa’s vast arid and semi-arid regions where livestock keepers use mobility to access seasonal pastures and water are being “enclosed”, moving communally held lands into the status of legally defined states of property. While the association between privatization and land fragmentation is clear (Galvin et al. 2008), and the direction of change away from commonly-held property seems apparent, this paper will argue that the unilineal model for the evolution of property is a self-fulfilling prophecy, since the proposition that privately-held property is the natural outcome of incremental changes in property forms has influenced tenure policy, thus creating (rather than confirming) the conditions that were predicted by the evolutionary model. In fact, in many settings both communal and state property have indeed given way to privatization, while in other settings private property has been taken over by the state or has reverted to communal holdings. What we need is a more dynamic model of conditions under which transitions occur in diverse directions between common, state and private forms of property. Beginning with Demsetz (1967), many property theorists have proposed that liberalization of land holdings and fragmentation of common lands into smaller and smaller “enclosures” are outcomes of long-term historical movements along a linear property continuum (See Figure 1). Indeed, Douglas North’s (1990, 2005) work emphasizes that the creation of property institutions based on law was foundational in the evolution of a modern economies and polities. Evolutionary approaches to property theory rest on the argument that there are disadvantages to communal property (specifically the weight of “externalities”) that grow over time in relation to population growth and increases in the value of land, the latter rising with new technologies or improved markets (Demsetz 1967, 347). The most important of these “externalities” are the costs of negotiating among many community members (i.e. ‘transaction’ costs – T) and policing boundaries (i.e. ‘exclusion’ costs – E). Population growth increases both costs, given that there are more people with whom to negotiate, and more who have reason to encroach. At each step along the property continuum, these costs are reduced through “internalization”, as the relevant group is reduced from ‘everyone’ under Open Access to a defined community under common property, and from the defined community to the individual holding private property or the state that holds state property. Demsetz (Ibid. : 356) points out that by internalizing what are externalities under common property (costs of transacting, arranging policing, assessing values, etc. ), the private owner can exclude others, can husband game, pastures and soil fertility, can “economize”, and can thus achieve greater efficiencies. Though this is a general argument, its applicability to privatizing the communal lands of pastoralists may seem apparent, since each owner can decide for (usually) himself and his family what strategy to adopt, and can plan ahead uses of privately-held resources, whether seasonal grazing or water allocation. This paper will examine cases of property transitions among Kenyan Maasai communities, in which we find side-by-side Group Ranch or community holdings, individualized holdings, and national parks, reserves and forests under state property. In interviews, numerous Maasai herd-owners have articulated similar arguments supporting sub-division of Group Ranches into individual family parcels. To take one example, a primary school teacher in Maji Moto stated that by sub-dividing land the individual holding “gives you the opportunity to develop your land. It is difficult to develop community land” (MM # 11, July 2013). We now understand that common property is not ungoverned, as is the case described by “open access”, but signifies defined holdings of a right-holding community. Today, commons are often held by municipalities, in the form of streets, sidewalks, parks, forests, grazing areas, paths, or rights-of-way, but in many areas of the world they are held by defined groups or communities, whose members retain the right to use and the responsibility to protect common-held resources. 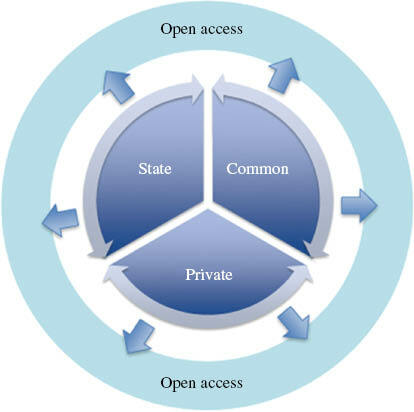 The property continuum is more complex than the bare emergence of privately held property (which in political philosophy is the quintessential notion of what property is all about), since common property emerges out of open access, and gives way both to private and state property, as Figure 2 illustrates. Consider, however, that ‘tenure’ – i.e. ‘holdings’ – is both a state of law and a state of practice, the two often colliding. Property concepts are notoriously sparse, with the taxonomic categories of common, state and private property encompassing an enormous amount of variation, in both law and practice. Field (1989, 321) proposes that we consider property to represent continuous rather than categorical or discrete variables; accordingly, we should observe land use and land claims as concrete practices, rather than just legal statuses, and the evocation of ‘law’ as simply a bureaucratic inscription without the force of effective governance. Tenure is most usefully seen, then, as representing not just states of law but points of friction and fractiousness between diverse interests, involving the political practices of asserting claims against others and acting on them. Like Demsetz, Field (1989, 325) proposes that transitions between common and private property reflect underlying conditions of economic efficiency, namely shifting balances between the two great ‘externalities’ of transaction and exclusion costs. But, unlike Demsetz, he observes that this balance shifts with circumstances, including the size of the holding, the value of the land, and the number of commoners. On a given parcel of land, the larger the number of common-holders, the more costly it is to carry out negotiations among them to achieve collective action, while under either state or individual holdings, the smaller number of negotiators (sometimes only one!) makes decisions easier to achieve. At the same time, the costs of exclusion increase with the number of holdings, each having a boundary to defend. In principle, transaction costs are functions of population dynamics (more people, more negotiations), but also of social structures and shared representations (cultural cohesion, greater agreement). In this regard, a society’s institutions and their perceived legitimacy provide a framework for negotiating and achieving collective action regarding land use, so one might assume that shared identities would decrease the frictions inherent in political processes and their social costs, mitigating the effects of population density and the demands inherent in transacting. Exclusion is a function of social boundaries and the governance systems that defend them: of course larger spaces entail comparatively greater costs than smaller, but overall space being equal, more fragmented and sub-divided spaces require far greater aggregate boundary maintenance! 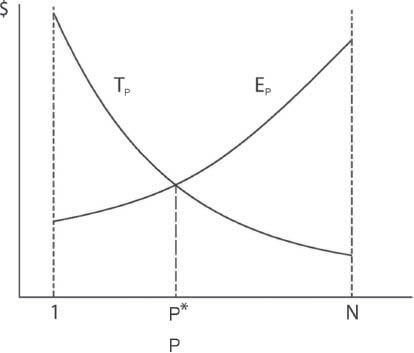 For a given area of land, with population, land productivity and land use held constant, transaction and exclusion costs should be inversely related as a function of the number of parcels into which the land is divided (Field 1989, 325) (See Figure 3). Efficient # of Parcels (P) as Functions of Transaction (T) and Exclusion (E) Costs (After Field 1989, 325). If a given land parcel remains whole (P = 1), transactions among its many members are more intensive than is the case when it is divided into N parts, in which case (on a sliding scale) transactions decline (since individuals occupy their own land). Inversely, exclusion costs are minimal on a single parcel, but rise as sub-division of the single holding into many parcels expands the length of borders to be monitored. In principle, there may be an optimal number of holdings where transaction and exclusion costs are balanced, at the intersection of the curves (P*): not too many but not too few. If the left side of the figure portrays the conditions under which common property emerges (minimized exclusion costs, higher transaction costs), the right side illustrates the pressures that may give rise to private property (minimized transaction costs, with higher exclusion costs). The vocabulary of costs and benefits seems unnecessarily reductive, given the range of social and political processes and cultural understandings that underpin property dynamics. Individuals and groups are not calculating machines but subjects whose actions reflect cultural commitments and values, and histories of friction and cooperation with their fellows. In this regard, I interpret the construction of arguments in terms of costs and benefits within the economic theory of property as metaphorical. The idea of ‘transaction costs’ expresses in short-hand the institutional effects that constrain and enable the social relations involved in mediating rights in flows of value, while the notion of ‘exclusion costs’ makes reference to the institutional framework that mediates territorial relations within and between groups. Nonetheless, institutions never simply exist, as such, but are practiced under particular conditions. In this regard, Figure 3 captures some underlying points of friction that occur when territory is governed with fewer or greater tracts entailing different degrees of political effort. The division of a given area of land, with a given population, into fewer or more numerous parcels, along a continuum, illustrates the transition from common to private property: from land held in common to land held by individuals. But climate, land productivity, parcel size and population sizes also underpin property forms, not within but between land parcels. Where, as in grazing lands, the intrinsic value of the land is low, excluding others may bring few benefits. In many semi-arid lands, boundaries are very porous, monitoring of frontiers only seasonal, and exclusion a matter of negotiation rather than force, with the costs of fencing unwarranted. In very dry lands or deserts, exclusion of others from pastures is not worth the effort, though water sources or oases may be defended jealously; indeed control of water sources on a communal or private basis may underpin control of pastures, as the case of Botswana illustrates (Peters 1994). But as the value of land increases, encroachment also tends to rise, making exclusion more and more challenging and costly, but necessary. In many cases, ecological factors underpin property forms, with open access emerging in the driest lands, common property in semi-arid regions, and private property on higher productivity lands, with greater rainfall. This transition can also be mapped onto the gradients of low to higher population densities that are often associated with rainfall and land productivity. But not always! On lands amenable to various uses, a linear, ecological model fails to account for tenure transitions. Rather, what is needed is a dynamic model of property that would describe the conditions under which land claims and land use move progressively and often incrementally between common, private and public holdings. Each form of property-as-use is susceptible to boundary erosions that at the limit create conditions of open access (See Figure 4). State lands, being difficult and thus expensive to monitor, are notoriously vulnerable to encroachment by private or community interests, and at the extreme become open access, as diverse land users encroach for minerals, timber, farming, grazing or hunting, or undergo frontier settlement by farmers seeking long-term residency. For instance, the forests of the Western Mau escarpment that rises out of the central Rift Valley of Kenya, have experienced an evolution from being held as Maasai community lands during the colonial period, then state forests, and then allocations (formal or informal) as community or private lands. When land is allocated via political patronage, holdings claimed may acquire legitimacy over time, and even gain legal force, if the state chooses to cede its rights to communities or collectivities of individuals. In the case of the Western Mau, a legal morass has arisen over whether legitimate titles had been issued, whether rights were still held by Narok County, which declared the forest a protected water-shed, and whether indigenous occupants should be favored over relatively new settlers (Matter 2010a, b). So land variously slips between state, community and individual holdings, fought out on-the-ground, in the press, and in the courts. A dynamic model of property transitions. The individualization of community or state resources goes on in forests and river valleys, as farmers encroach on common lands and create de facto claims in the form of cultivated lands, houses and fences. At the same time, the communalization of privately-held lands often occurs in the form of resurgent claims to lands once held collectively, often accompanied by intimidation and the establishment of on-the-ground presence. This especially happens when processes of land privatization fail to win local recognition such as when outsiders come to claim shares. At the same time, States continually acquire both collective and private holdings for their own purposes, whether through legal appropriation or claiming eminent domain over lands targeted for public purposes, the imposition of ‘easements’ that deprive owners of certain rights, or via seizures by elites through exercising pressure or utilizing force. A dynamic model would describe the conditions under which land use transitions occur between common, state and private claims, without assuming that any given form of property represents an inevitable end-point in this transition. Pastoralists are increasingly reasserting informal rights over freehold or state lands, in effect restoring the commons. Cases that reverse conventional evolution are presented below, where pastoralists have reoccupied privately held or state lands, in some cases their informal initiatives being repaid by their gaining legal title for their communities, in others de facto control, which, after all, is what it means to ‘hold’. In what follows, we find a counter-current of resistance against rangeland enclosures, land fragmentation and pastoral sedentarization, animated by the exigencies of pastoralism (continued mobility) but also as responses to violence from neighbours, control by the state, or land appropriation by a rural elite (Galaty 2013, 2015). Can the dynamics of pastoral movements intended to occupy, use and claim territories, with the exercise of force and persuasion, be explained in terms of the inversely correlated curves for transaction and exclusions costs, or the more complex underlying institutional dynamics that those curves serve as proxies for? The three scenes examined include areas where pastoralists are reasserting rights over rangelands in north-central and southern regions of Kenya, in effect reconstituting common property. The infamous second Maasai Move was brought about by a colonial strategem to force the Maasai to vacate the Laikipia plateau (moving to the enlarged ‘Masai Reserve’ on lands now defined as Kajiado and Narok Counties) in favor of European settlers who were allocated long-term leaseholds that defined their sizable ranches as private holdings (Hughes 2006). During the extended drought of 2004–2005, Laikipia Maasai and Samburu herders moved onto commercial ranches to gain access to grazing, but, given that the date marked 100 years since the first Maasai Treaty, some took the opportunity to assert that the leasehold period of 99 years was now over, and that these lands should revert to the Maasai (Galaty 2008, 35) (See Map 1). 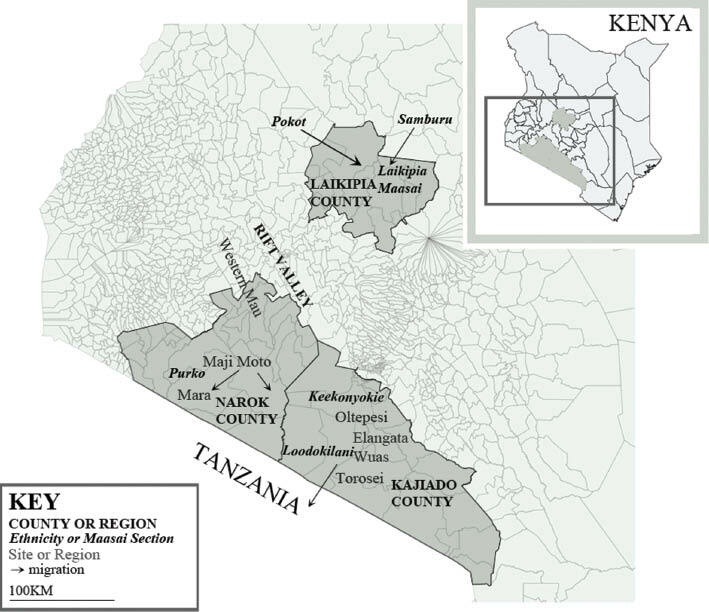 Pastoral Counties in Kenya showing Research Sites and Maasai Sections. At least one man died and many were injured when force was used to evict herders and their livestock, but the events mobilized Laikipia Maasai, led by the NGO ‘OSILIGI’, who in large “prayer meetings” reiterated their claims to the land. In recent decades some Laikipia ranches have been purchased by land-buying companies and sub-divided into small-holder farms that have proven relatively unproductive due to low rainfall, while others have been maintained as intact ranches (under original or new owners) that have increasingly been dedicated both to commercial livestock production and wildlife conservation and tourism; in fact, more wildlife is now held on Laikipia ranches than in Kenya’s national parks and reserves (Western 2002). But with the fractiousness and insecurity that has emerged due to counter-land-claims and increasing violence, some ranches have been left unguarded, and increasingly unproductive small-holder farms have been left unoccupied or ‘abandoned’ (Wade 2015). In effect, exclusion costs have mounted both due to fragmentation of land into smaller parcels and to a broader climate of insecurity that has discouraged large ranch owners from investing in fences and other technologies for securing boundaries. Exerting pressure and exploiting this opportunity, pastoralists from the near-north of Kenya (Laikipiak, Samburu, Pokot) have been moving onto these “abandoned lands” to graze, and increasingly settling and making claims to the land. While transaction costs were earlier reduced through subdivision of these lands, some taken over by land buying companies before being sub-divided, the cultural gulf between commercial ranchers (often serving as conservationists), small-scale farmers and pastoralists has made extensive and costly negotiations necessary, which have in some cases been mitigated as pastoralists with similar objectives have established occupation. So the land has gone through a transition, from being managed as private-holdings – both large and small-scale – through a stage of ‘open access’ as owners have ‘abandoned’ them, to being relatively stable common holdings, governed by the pastoralists who have moved in and asserted rights. In some cases, pastoralists have purchased one parcel of land in order to access a greater expanse of surrounding lands that are effectively abandoned. The new pastoral settlers claim the land based on historical precedence (it once belonged to pastoralists: the Laikipia and then the Purko Maasai), effective occupation and ongoing land use, with buildings and community structures being erected, and tacitly through threats of violence. In the meantime, individuals acquiring formal title deeds through legal transfer of these lands may find their land rights denied by those with effective occupancy. The central Rift Valley of Kenya was occupied in 1905 by European settlers, based on the terms of the First Maasai Treaty by which Maasai ceded the Rift Valley in return for being granted rights to two reserves, a southern reserve in Kajiado, a northern reserve in Laikipia. Under the Second Maasai Treaty, signed in 1911, the terms of the first were abrogated, with Laikipia ceded for European settlement in exchange for an enlarged Reserve in the south, to which Narok and Trans-Mara regions were added. The productivity of large-scale commercial ranches in the Central Rift Valley, from the Kedong Valley through Naivasha to Nakuru and northward, largely depended on Kikuyu labour, but many Maasai who had declined to move also continued to occupy the areas that had been legally ceded to the British colonial government. After Independence in 1963, some privately held settler ranches were acquired by the government (with World Bank funding) for settling landless Kikuyu, but over the next few decades other ranches were acquired by Kikuyu land-buying companies or community groups, some purchased freely or acquired under pressure, in which some Maasai were included. At the same time, as lands were left or sold, additional Maasai joined long-standing communities to help claim land and strengthen the Maasai presence. In recent years, the Maasai community that lives just south of Lake Naivasha, on lands formerly held under freehold title by Lord Delamere, were awarded a community title based on ‘adverse possession’, a claim grounded on the argument that they have been in continuous possession and use of the land for at least 12 years without the legal owners pressing claim. Here, we find lands shifting from individual to communal holding, under the umbrella of a clear title. To the south-east of Naivasha, another Maasai community has been involved in a land case with respect to Ngatia Farms, which lie near Kedong’ and Akira Ranches between Long’onot and Maiella, that has a complex history of ownership. The Maasai community claims that on the basis of long-standing residence (and thus adverse possession), it should be allocated title of the land, which was given up by the former owner, a European settler. But a non-Maasai faction claims that it had purchased the land from the previous owner, thus preempting the Maasai community claims, while Maasai lawyers claim that the sale should have never occurred given the outstanding claims by long-term occupants. It appears that the courts divided the lands between the two groups, but this was never acted on. In the meantime, the quite major Olkaria IV Domes Geothermal Field, within Kedong Ranch, is scheduled for development by the major Kenyan power-generating parastatal company, KenGen, for the purpose of geothermal power development, on an area of about 4 sq. km now occupied by the Maasai and used for grazing. However, KenGen has yet to establish its title over these lands, due to the legal case between parties claiming land rights. There is some suspicion that it played a behind-the-scenes role in the court case, arranging that a key portion of the ranch needed for power generation be allocated to non-Maasai on the understanding that it would be transferred to KenGen for a tidy return for that group. The Maasai community insists that all discussions over compensation must be carried out with their leaders. In May, 2013, immediately after the court ruling, an attack on the Maasai village of Narasha was carried out by young thugs, defended by armed police, who destroyed 247 homes, using axes, sledgehammers and chain saws, after which the homes were burned, making sure not only that they could no longer be habitable but that no possessions of the Maasai families involved could be recovered.2 It would appear that this criminal attack, in which 300 bullets were reportedly fired and several people injured, was carried out at the behest of one of the parties in the legal conflict, without the central government’s awareness or sanction. Here, preemption, occupation and claims to land by a community proceed on the basis of ‘presence’ through on-the-ground dynamics and legal recourse mixed with politics (Galaty 2005). The shocking attack was the subject of major stories in the Kenyan news, interviews of major public figures, and disavowals of responsibility by the government. Since the Maasai community is still residing in Narasha, in temporary structures, it is not clear that this preemption by their legal opponents will help the latter’s case. But it does make clear a ploy frequently used in Kenya, which is for elements of the government (in this case the Court) to allocate lands to favoured individuals who then flip the land to a developer, after which returns are pocketed, not just by the individuals but by their agents in government. This case illustrates the transition from privately held land to counter claims by the State and a community, the latter insisting that it has held the land even through the period of private ownership as property occupied by and governed by the community. Commercial ranches established during the Colonialism and perpetuated through the Post-Colonial period benefitted from State support in profiting from low transaction costs and relatively low exclusion costs, guaranteed by the recognition of ranch boundaries by neighbours, who effectively formed localized consortiums. These ranches were neither too large nor too small, so benefitted from the optimization of transaction and exclusion costs depicted in Figure 3. However, with the weakening of private rights that emerged as the State and communities both asserted their claims, strict exclusion became impossible and transactions so fraught that the courts, the World Bank and international opinion became entangled in negotiations over successor land rights. Unlike the case in Scene 1, the most likely outcome is that the Maasai community will ultimately cede land to the State for power generation, in return for resettlement on another parcel of property held by the community. The best outcome for the community would be the promise of a certain percentage of the royalties for power generated, which would represent a recognition of community rights in the context of State enterprises. Furthermore, this case and others in the Rift Valley represent the reassertion of historical community rights that for the last century were superseded by individual, private titles, a type of slow justice! The cases described above occurred where large-scale commercial ranches experienced two processes that altered the equilibrium they had struck between securing their borders and negotiating with their neighbours, both in Laikipia and the Rift Valley: firstly, ownership by commercial ranches being superseded by collectivities (land buying companies or community claimants), which greatly increased transaction costs, and in some cases transitions of large holdings to individual parcels created through subdivision, increasing exclusion costs, all the more so due to threats of violence. But in many pastoral regions of Kenya, lands held in trust for entire communities (i.e. Maasai, Samburu, Laikipiak) had already undergone adjudication as Group Ranches. Notwithstanding lack of consensus over some borders between Groups Ranches which led to some strife (Galaty 1994), the major challenge in Group Ranches involved difficulties in achieving consensus regarding leadership, governance, and ultimately the destiny of land rights. On many Group Ranches, the tension between collective action and individual interests, mixed with corruption of elites, led to subdivision of land into land parcels that would be individually owned by member families, adding to that number those illicitly introduced onto the registry through favouritism, political influence or bribery (Mwangi 2007; Galaty 2013). Some Group Ranches, however, refrained from sub-division and still manage themselves as relatively large and integral holdings. In principle, just as Group Ranches had the right of exclusion of non-members, each individually owned parcel could be exclusively used by the family that owned it, although some friends established agreements that they would share land, maintaining residences on one person’s holding and using another’s for seasonal grazing. Since entire Maasai or Samburu territorial sections were often insufficient to provide adequate grazing through all seasons, not to mention the Group Ranches that were carved out of them, clearly few if any individual family holdings were sufficient in size that family herds could be kept on home ranges through the cycle of seasons, especially in times of drought. Given the inexorable trend towards sub-dividing common holdings into individual parcels of land in Maasai areas, despite the profound problems of pursuing livestock husbandry in drylands on fragmented, bounded and increasingly smaller land parcels, what strategies could be used to manage herds under drought conditions of diminishing pastures or highly localized grazing due to sporadic rainfall? The cases presented below illustrate a reversion to the principles of common land management across the rangelands. Mobility strategies used by herders in Narok and Kajiado Districts (now Counties) to respond to the prolonged drought of 2008–2009 (Archambault et al. 2014) were studied by a team of researchers based at McGill and in Kenyan pastoral NGO’s. Several sites under study had undergone Group Ranch sub-division so its members were faced with the condition of land privatization in their home areas and in neighbouring areas (Mwangi 2007). Other sites still had not undergone sub-division, which provided herd owners greater latitude in practicing mobility to access water and pastures. The effects of ecological stress are associated both with prolonged drought and with property transitions that often have altered rights of residency and land use from those held in common to individual, family holdings. Under these conditions, what strategies of mobility were practiced and how do they reflect transactions between herders over pastures, including their exclusion from pasturelands in which they no longer enjoyed rights? The cases reviewed below were drawn from reports by herding families from Lodokilani and Keekonyokie territorial sections in Kajiado County, and the Purko section in Narok County. In Elangata Wuas in Loodokilani section, the following scenarios describe the outcomes of some families. In Case 1, one household split its herds, and drawing on family and friendship ties moved some animals to three other neighbouring territorial sections in Kajiado, namely Damat, Kangere, and Matapato, and back; the Group Ranches in all of these sections had been subdivided into family holdings. Although the receiving homesteads reflected ties of kinship or friendship between families, they also illustrate the recognition of solidarity between territorial sections, some of them with histories of tension between them, which especially applies in times of drought. In Case 2, a household from Elangata Wuas, with a widow and sons and few cattle, moved livestock first to Torosei, a neighbouring Group Ranch within Loodokilani section that lies along Kenya’s southern border, and then over the border into Tanzania, near Enkare Naibor. This involved moving into yet another territorial section, of the Kisongo, and challenging the integrity of an international border. Indeed, a significant number of herds from the Kenyan Maasai were moved over the border into neighbouring areas, or further south to Simanjiro, which retained more grazing than elsewhere in the entire region. Unfortunately, all the animals were lost due to their entering an unfamiliar ecosystem with unanticipated disease threats. This high level of mobility represents a strategy used by the relatively poor when they had available labour. The willingness of friends and kin to allow families from Elangata Wuas to bring their livestock to neighbouring sections indicates that even under conditions of land privatization and subdivision, residual rights of Maasai to grazing lands where they are normally not resident are recognized. Similar willingness of Tanzanian Maasai to receive their Kenyan neighbours under stress is both an act of generosity and a sign that pastoral territoriality is multi-layered, with Maasai holding situational grazing privileges throughout what, in the last instance, is a single commons. As such, under situations when borders are opened across a single pastoral commons, exclusion costs diminish while transaction costs rise, the latter involved in negotiating access to more distant grazing areas. Oltepesi lies in southern Keekonyokie, down the long road from Nairobi to Magadi. Households in this site have strong livestock holdings, and in recent years had gained title deeds due to Group Ranch subdivision. In Case 3, the household of a widow whose deceased husband had sold all of their land following sub-division engaged in rapid movement of animals around the section to access sparse grazing as it was available. So despite land privatization and subdivision, individual family boundaries were not upheld in such a time of stress, but access across the lands of their previous Group Ranch, which although legally defunct remained a unit of political recognition, was acknowledged. In Case 4, another household had retained 50 acres allocated at the time of subdivision, but had few cattle. The household head migrated to Kiambu (a neighboring county largely inhabited by non-Maasai farmers, the Kikuyu, who practiced more intensive agriculture). He sought to access a grazing area on a European settler’s farm, which was possible due to his familiarity with the farmer’s workers who for a fee opened the gate to him. The payment of a fee and recognition that he was entering a farm owned by another individual demonstrates that this did not represent a reassertion of rights to a common. Unfortunately, all of the animals died due to eating grass on which fertilizers or pesticides had been applied, which shows the risk involved in moving into unfamiliar lands. Maji Moto Group Ranch lies south of Narok along the road to the Masai Mara Game Reserve. At the time of the drought, the Group Ranch had not yet been subdivided, although this was subsequently carried out in 2012–2013 (Riamit 2014). In Case 5, one household had fenced 800 acres of common land, anticipating that this would strengthen its claim to the land in the event of subdivision. This was approximately 15 times the amount a single title-holder would receive when subdivision did occur, so did not receive community approval. During the drought, the family decided not to move its livestock, but used its resources to provide feed and veterinary medicine to its animals to help them survive the stress produced by the scarcity of grazing. Both the husband and the wife had salaried incomes drawn from the teaching profession and business, so were not available to accompany livestock had they wished to move. But more importantly, they followed a pattern whereby those financially able to access the market for fodder and antibiotics to provide supplements and prophylactics for their livestock tended to leave their animals at their home base, rather than accessing better grazing that could still be found nearer to the Mara region. But in Case 6, a poorer family, also trying to claim land by settling on it in anticipation of future sub-division, did not have the means to provide feed for their livestock so moved their herd, initially to nearby mountains and subsequently to an area outside Masai Mara Game Reserve to join the family head’s father-in-law (Osano 2013). As in Cases 1 and 2, this family benefitted from recognition of solidarity among members of different Group Ranches across the same section and the continuation of rights to common pastures, independent of the progressive creation of district, locational, Group Ranch and then individual family boundaries from the Colonial to the Post-colonial period. When convenient, and when pastures were relatively plentiful, herders were content to stay in their home areas, but when drought threatened the well-being of livestock on which families subsisted, borders were ignored and residual rights to graze throughout their own Group Ranches or sections were granted recognition, thus marking the resurgence of the commons. The conditions described underpin the benefits enjoyed when land-owners in dry lands cease trying to exclude others, leading to more efficient use of scarce pastures, optimizing the chance of livestock survival, and recognition of solidarity among herd owners, among a single ethnic group – the Maasai – divided into territorial sections. Given a certain solidarity based on language, ethnicity and culture, the sort of negotiations needed in order to show respect for other landholders diminishes, making minimal the overall costs of reverting to a commons. If one asks whether, in accord with the assumption of conventional property theory, herd owners wouldn’t be better off remaining on their own land, relying on their own resources, one answer is that the strategy of private property loses the advantages of scale in resource allocation, under which a better match between grazing and livestock is achieved through rapid movement to areas with remaining grazing and water, treating an entire area like a commons. To summarize, the strategy of stasis proved most effective when pursued by households that enjoyed outside income-generating activities which generated sufficient revenue to allow purchase of supplementary feed and drugs. Mobility, on the other hand, was a strategy used by some poor households that could not afford feed; kinship networks were often used as channels through which to find alternative grazing and water. Mobility was also used by some of the rich, who were able to hire labourers and sometimes lease grazing, and at the same time to provide livestock supplementary feed and drugs to prevent or cure diseases that accompanied the physiological stress of diminished nutrition for livestock. As an informant said, “without rain no land is private”. Under conditions of drought, few people were in a position to exclude others from their land. However, some charged a fee for use of grass. Drawing on social networks, some herders moved between Group Ranch areas within their own sections, and across other Maasai sections, in order to find grazing. Furthermore, many pastoral families from southern Kenya moved into Tanzania, in the north near Oldoinyo Naibor, and further south to Simanjiro, where grazing was known to be better. What can we conclude about the costs of moving into areas owned and held by other communities? In times of drought, few expect herders to remain on their own land, and except for fenced areas the process of exclusion collapses. In some cases, however, those seeking to cross private land for water or pasture are levied a charge. Exclusion costs, then, dramatically diminish and in general the land reverts to common holding or even open access. At the same time, transaction costs diminish because households tend to act with a high degree of autonomy. Negotiations do continue, however, with regard to enclosed lands, with herders seeking pasture for livestock that they are willing to pay for, and to pay respect to normal residents of regions into which a herder moves. Significantly, transaction costs are least within the same Group Ranch (even if sub-divided), where there is a history of pasture sharing, and even within the same territorial section, i.e. between Oltepesi and Ewuaso Kedong’ within Keekonyokie section, between Elang’ata Wuas and Torosei within Lodokilani section, or between Maji Moto and the Mara within Purko section. So movements within the same Group Ranch and within the same territorial section tended to be rapid and coordinated, with minimal transaction costs. Across territorial sections, especially those without historical and cultural ties, moves required greater negotiation, and tended to be carried out through networks of age-mates, friends and kin, often through in-laws. The structure of these links tended to keep transaction costs to a minimum. This paper proposes that property is best seen both as a formal state-of-law and an informal state-of-practice, of holding, using and claiming values, most importantly in land. The latter often draws from customary precedents, and relies on diverse political strategies to access land, make use of its resources and preempt the claims of others. These sorts of informal processes were those that the evolutionary property theorists described in theorizing when land would go through a transition from common to private holdings (in Demsetz’s case) or through reciprocal transitions from private to common holdings (not to mention the complications introduced by transformations from and to state holdings). What I have called a ‘dynamic’ property theory recognizes conditions under which property claims can, according to underlying points of friction, described in economic theory by notions of efficiency and from other theoretical perspectives as involving institutional factors and values, move towards a particular tenure form in response to shifts in transaction or exclusion costs, which often act in inverse ways, depending on the scale and number of holdings. Climatic conditions clearly play a role; generally higher rainfall makes smaller holdings – whether for grazing or cultivation – more viable, makes land more attractive to others, and so requires greater vigilance to carry out exclusion or negotiate access (Homewood 2008). At the outer margins of low rainfall or drought, the increasing costs (in time, preoccupation or force) of excluding a growing number of would-be resource users makes the entire process impossible and boundaries crash. Sites that were especially inviting during the 2008–2009 drought were Simanjiro, in Tanzania, where herders from southern Kajiado fled, and the Mara region, where herders from northern Narok moved. Clearly, the willingness to cease excluding people and their livestock in drought was influenced by more than sheer numbers, since the age-old Maasai ethic of providing aid in times of need was respected across territorial sections and even countries. So underpinning costs and benefits are sources of solidarity and structures of conflict, as uses of property emerge from dynamics of society and territoriality. But the resurgence of the right of the commons (within ethnic limits) were usually limited in time, since at the end of the drought everyone went home. Of longer-term significance are the claims to privately held lands in Laikipia and the Rift Valley by neighboring communities who either move in or press legal claims based on long-term residency and the legal basis of adverse possession. Here, the ability of landowners to exclude others depends on the legitimacy of their holdings being recognized by surrounding communities and on forces they can muster. Often, pastoralists neither grant such claims legitimacy nor respect force exercised in seizing land. So we can probably expect an increasing number of challenges to state and private lands by pastoral communities, strengthened by the land articles to the 2010 Constitution that formally recognize the legitimacy of community lands, as they practice the “new pastoral mobility” (Galaty 2015). What we find today is the onset of more fluid systems of tenure than the inexorable spread of privatization through tenure formalization and land fragmentation would have suggested would occur in the 21st century. 1A version of this paper was presented at the 2013 meeting of the American Anthropology Association, in the panel on “Pastoralism and the New Commons: Co-Management, Conflict and Cooperation”, sponsored by the Society for Economic Anthropology. 2For online coverage of this incident, see the following: http://www.youtube.com/results?search_query=Olkaria. Material presented in this paper derives from the “Pastoral Property and Poverty” project, supported by the Social Sciences and Humanities Research Council of Canada and McGill University. The project has been pursued in affiliation with the Ethnography Unit of the National Museums of Kenya (Kenyan research authorization #: OP/13/001/25c 261/8) by a research team based at McGill University and in Kenya. The project was administered through the Centre for Society, Technology and Development (STANDD) at McGill, in long-term research cooperation with Mainyoito Pastoral Development Organization (MPIDO), in affiliation with community-based land rights organizations in Kenya: the South Rift Land Owners’ Association (SORALO), the Olmaa Pastoralist Development Programme (OLPADEP), the Elangata Wuas Environmental Management Programme (EWEMP) and Africa SOMA, and the Indigenous Livelihoods Enhancement Partners (ILEPA), and with the collaboration of Dr. Caroline Archambault, Dr. Joost De Laat, Prof. Tim Johns, Prof. Jon Unruh, Stanley Kimaren Riamit, Joseph Ole Simel, Stephen Moiko, Daniel Ole Tinaai, John Kamanga, Lawrence Mbelati, Julia Bailey, Corey Wright and Jennifer Glassco, and the assistance of Sabina Sloman and Arvind Eyunni. Archambault, C, Matter, S, Riamit, S. K and Galaty, J (2014). Diversifying Maasai Diversification: Macro-Level Factors and Contrasting Livelihood Pathways in Contemporary Kenya In: Rural Livelihoods, Regional Economies and Processes of Change. Sick, D ed. New York: Routledge, pp. 58–84. Demsetz, H (1967). Toward a Theory of Property Rights. American Economic Review 57: 347–359. Field, B (1989). The Evolution of Property Rights. Kyklos 42 Fascicle.3: 319–345. Galaty, J (1994). Rangeland Tenure and African Pastoralism In: African Pastoralist Systems: An Integrated Approach. Fratkin, E, Galvin, K and Roth, E eds. : 185–204. Boulder & London: Lynne Rienner. Galaty, J (2005). Double-Voiced Violence in Kenya In: Violence and Belonging: The Quest for Identity in post-colonial Africa. Broch-Due, V ed. : 173–194. London: Routledge. Galaty, J (2008). Violence and its mediations: Civil society, community conflict and the state in East Africa In: Beside the State: Emergent Powers in Contemporary Africa. Bellagamba, A and Klute, G eds. : 23–54. Cologne: Rüdige Köppe Verlag. Galaty, J (2013a). Land Grabbing in the Eastern African Rangelands, Ch. 12 In: Development at the Margins: Pathways of Change in the Horn of Africa. Catley, A, Lind, J and Scoones, I eds. : 143–153. London: Earthscan, at Routledge. http://dx.doi.org/10.3167/np.2013.170204. Galaty, J (2013b). The Collapsing Platform for Pastoralism: Land Sales and Land Loss in Kajiado County, Kenya. Nomadic Peoples 17(2): 20–39. Galaty, J (2015). Pastoralism in Anthropology. International Encyclopedia of the Social & Behavioral Sciences. 2nd edition Vol 17 Editor-in-chief.Wright, J. D : 577–583. Oxford: Elsevier. http://dx.doi.org/10.1016/B978-0-08-097086-8.12124-5. Galvin, K, Reid, R, Behnke, R and Thompson Hobbs, N eds. (2008). Fragmentation in Semi-Arid and Arid Landscapes: Consequences for Human and Natural Systems. New York: Springer. Homewood, K (2008). Ecology of African Pastoralist Societies. Currey, J Oxford, Athens OH, Pretoria: Ohio University Press, Unisa Press. Hughes, L (2006). Moving the Maasai: A Colonial Misadventure. Houndsmills: Palgrave McMillan. Lesorogol, C. K (2008). Contesting the Common: Privatizing Pastoral Lands in Kenya. Ann Arbor: University of Michigan Press. Matter, S (2010a). Struggles Over Belonging: Insecurity, Inequality and the Cultural Politics of Property at Enoosupukia, Kenya. PhD Dissertation, McGill University, Department of Anthropology. http://digitool.library.mcgill.ca:8881/R/?func=dbin-jump-full&object_id=96724. Matter, S (2010b). ‘Clashing Claims: Neopatrimonial Governance, Land Tenure Transformation, and Violence at Enoosupukia, Kenya’. Political and Legal Anthropology Review 33(1): 67–88. http://dx.doi.org/10.1111/j.1555-2934.2010.01093.x. McCabe, J. T (2004). Cattle Bring us to Our Enemies: Turkana Ecology, Politics, and Raiding in a Disequilibrium System. Ann Arbor: University of Michigan Press. http://dx.doi.org/10.3998/mpub.23477. Mwangi, E (2007). Socioeconomic Change and Land Use in Africa: The Transformation of Property Rights in Maasailand. New York: Palgrave MacMillan. http://dx.doi.org/10.1007/978-1-137-06659-6. North, D (1990). Institutions, Institutional Change, and Economic Performance. Cambridge: Cambridge University Press. http://dx.doi.org/10.1017/CBO9780511808678. North, D (2005). Understanding the Process of Economic Change. Princeton, NJ: Princeton University Press. http://dx.doi.org/10.1515/9781400829484. Osano, P (2013). Direct Payments to Promote Biodiversity Conservation and the Implication for Poverty Reduction among Pastoral Communities in East African Arid and Semi-Arid Lands Biodiversity Conservation Payments and Poverty Reduction in a Pastoral Community in Kenya. PhD Dissertation. McGill University, Department of Geography. http://digitool.library.mcgill.ca/R/?func=dbin-jump-full&object_id=119494. Ostrom, E (1990). Governing the Commons. The Evolution of Institutions for Collective Action. Cambridge: Cambridge University Press. http://dx.doi.org/10.1017/CBO9780511807763. Peters, P (1994). Dividing the Commons: Politics, Policy, and Culture in Botswana. Charlottesville: University Press of Virginia. Riamit, S. K (2014). Dissolving the Pastoral Commons, Enhancing Enclosures: Commercialization, Corruption and Colonial Continuities amongst the Maasai Pastoralists of Southern Kenya. MA Thesis. Department of Anthropology, McGill University. http://digitool.library.mcgill.ca/webclient/StreamGate?folder_id=0&dvs=1474148457848~194&usePid1=true&usePid2=true. Wade, C (2015). The Strategic Use of Private Property in a Rangelands Environment. The Political Ecology of Pastoralist Land Use Dynamics and Property Rights in Laikipia County, Kenya. MA Thesis, McGill University, Department of Geography. Western, D (2002). In the Dust of Kilimanjaro. Second Edition Revised with a new afterward.Washington, DC: Island Press for Shearwater Books.